Chinese has been known as one of the Oldest Languages on the Planet. That is probably the reason, why their letters and characters do not look any closer to all other languages. Chinese Characters are holding a Real Meaning, which are representing some of the Most Powerful Symbols for a Human Kind.This Silver Pendant holds Silver Sign, which represents GOOD LUCK and WEALTH meaning. 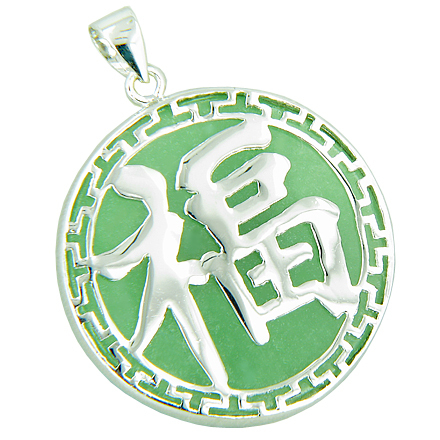 This Symbol is Really Old and Popular in China, and used in every Family to Bring Good Luck, Prosperity, Abundance and Miracles.This Silver Pendant comes as JADE Circle with SILVER GOOD LUCK and Labyrinth Symbols. This makes the Pendant to be Extremely Lucky for its immediate owner. Very SPECIAL Outlook and Eye Catching Design.